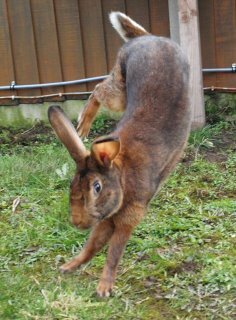 The government is promoting fitness for all in this Olympic year, and because so many rabbits suffer health problems because of bad diet and lack of space to exercise, we are joining in with a call for fitness for rabbits. So are your bunnies world-beating athletes or hutch potatoes? These are the events where we think your rabbits should be aiming for their own medals. Long jump, Triple jump and High jump – given the right conditions, your rabbits will be able to show you their own interpretations of these events! Sprint and Hurdles – don’t expect your buns to stay in their lanes though! Distance running – in the wild, rabbits cover an area of up to 30 football pitches in a day, so give them as much room as you can. Relay – because, of course, your rabbits are in neutered pairs or compatible groups, aren’t they? Football and Volleyball – give them something to knock around their enclosure, they’ll love it. Gymnastics – they’ll get top marks for artistic impression if you give them what they need! And their very own event, most importantly, in which all rabbits can excel, Digging and Tunnelling. So…are your rabbits fit enough? Check our Making it Right page for some ideas on how to let them show their Olympian natural behaviours! None of the Olympic athletes got as fit as they are in a day. For them it takes years of training. Please remember that if your rabbits aren’t used to having lots of space, don’t throw them in at the deep end. Increase their area gradually with a partition within a larger enclosure over a period of weeks. An overweight, unfit human can’t take to the running track, and neither can your rabbit. Do it slowly and carefully – but please…do it! Very true. 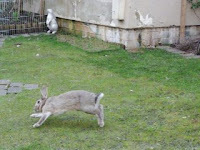 Rabbits need exercise to stay healthy. These pictures made me smile! I have two buns, Lucy is very spritely and loves to run and binky. Bobby on the other hand was never like that and I entered her in the PDSA fit club to help her lose some weight and get fit. She's now down to a healthy weight and enjoys to run about too.